It has been widely lamented of late that the average worker is sinking into a state of near serfdom—especially with respect to onerous debt, dubbed “debt serfdom”, increasing work hours and the need to hold down multiple jobs, often at lower wages and salaries than previously held, expected or baby-boomer jobs. Whether or not this is an accurate portrayal of the lot of the average worker, to Millennials saddled with huge student loans, poor career prospects and a patchwork of multiple low-pay jobs or no-pay internships, this has to sound all too familiar and too much like what they imagine the lives of medieval serfs to have been. But, despite the negative popular image of serf lifestyles, the discovered facts of medieval serf life warrant asking whether having the work life and workload of a real serf would really be such a bad thing? Surprisingly, as some historical research—cited in the quote above and below—suggests, the answer may be “no”. Accordingly, it may be more accurate to say that rather than being reduced to a state of serfdom, the modern worker is sinking farther from it. On the other hand, the actual change in the annual number of hours of work put in by the average employed American between 2000 and 2012 suggests the opposite trend: On average, Americans are working less now than they were a decade ago, even if not less than a feudal serf. But first, what is stoking these fears of “neo-serfitude”? It’s a perceived slide into debt serfdom for many among the “other 99%” that is stirring a lot of anger and bewilderment. The middle class, widely regarded as cratered by the 2008 recession its aftermath, and the financial and other machinations that triggered and perpetuate it, is said to be collapsing like a controlled demolition onto and into the working classes below them, all falling like broken, pancaking dominoes in free-fall. Falling into a deepening financial hole, cash-strapped, asset-poor and debt-burdened, the neo-serf has, it seems, become a poster child of diffusing debt, job insecurity, subsidized dependency, unfreedom and poverty—the kind of calamity that Friedrich A. Hayek, free-market ideologist and Nobel Laureate in economics, warned of way back in 1946 in his now-classic cautionary analysis, The Road to Serfdom [PDF download]. But the modern slide into serfdom is apparently more than just a plunge into insurmountable debt—whether measured on a personal or national scale. Presumably, many modern workers are also slipping back in time to a generally more overworked, historically earlier lifestyle—either in the form of having to hold down more than one job or to put in more and more hours working, not only on the job, but while at home, commuting or otherwise apart from the workplace. At the end of a vanishing golden age of increasing leisure time and financial security, these workers appear to be slipping back into a precarious lifestyle of unremitting toil, limited assets, reduced economic mobility and exhaustion usually identified with that of the average medieval serf. Looking back at the high times of post-WW II U.S.A. and the myriad labor-saving industrial machines and consumer devices created by the Industrial Revolution, it seems tempting to suggest that the principal labor saved has been that of the average housewife and DIY home handyman, rather than the labor of the average worker who produced or operated these innovations. “According to a new Federal Reserve report, median household net worth – a barometer for the economic health of working class households—took a huge hit from the Great Recession, dropping from $126,400 in 2007 to an 18-year low of just $77,300 in 2010. That’s stunning: a 39% decrease in household net worth. 1. The debt is almost impossible to repay [as the lack of “good jobs” forces more borrowing to survive, hide out in school, or get a undergrad or post-grad degree imagined to lead to a good job]. 2. So much of the serf’s income has to be allocated to debt servicing that the quality of life suffers terribly and free time to either improve, organize protests against or escape it is severely limited. 3. Little of the debt is capital investment debt, most being unproductive, e.g., consumer debt for inessentials, or for the basic necessities of life, at best subsistence “investments” in labor as a resource, rather than in much-higher ROI investments, such as infrastructure. 4. Absent a dramatic paradigm shift, e.g., away from finance capitalism to the creation of tangible goods and associated services, debt and wealth disparities in society are much likelier, if not certain, to increase, rather than decrease, with worsening debt/income ratios. Outstanding student debt from federal and private loans totals close to $1.2 trillion, and more than 7 million borrowers are in default on their loans, representing about half of all student loans, meaning they are more than 270 days late on a payment, according to the Consumer Financial Protection Bureau. Only 10% have enrolled in income-based repayment plans [as of August 2013]. Under the federal “Pay As You Earn” plan, for example, monthly payments can never exceed 10 percent of a borrower’s income, and any debt left over after 20 years is forgiven. Less than 50,000 borrowers are enrolled in that plan. [Source: U.S. News, August 19, 2013] Whether this low participation rate is due to a lack of information about the program or of income to participate in it is an important question to ask. In 2011, 1.5 million, or 53.6% of college grads under age 25 were out of work or underemployed, according to a 2012 [Source: Forbes, May 28, 2013]. To the extent that, in any given case, underemployment is a marker for student-loan indebtedness, student borrowing is a 2-lane expressway to debt serfdom: the first lane—for all those borrowers; the second, for those with jobs inadequate to repay those loans. A U.S. Census report determined that 71 percent of the nation’s 19.7 million college undergraduates were working in 2011. Of that number, one in five undergrads were working at least 35 hours a week year-round. [Source: CBS Local News, February 15, 2013]. Notice that this cannot be compared to a serf’s tradel-honing craft apprenticeship, when a pre-med student’s’ 35 hours are only in a Burger King or Starbucks—unless it counts as fieldwork in the area of public health and nutrition. Of course, the serf’s nearly 6-months’ of leisure were not the result of lord of the manor superior enlightenment, compassion or generosity. Medieval farm fields—unlike the machines of the industrial age—yielded output seasonally, not 24/7/12. Still, many landlords owned mines, mills and other enterprises to which serf labor could and was assigned, yet on an average of only 3 days per week. 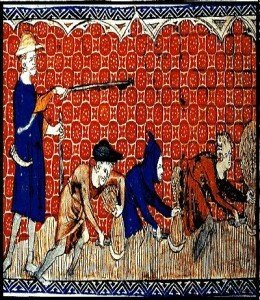 One possible reason for the plentiful leisure of many medieval Western serfs is that a serf was also a tenant, with rights of possession of the parcels of land allotted him and his family, with a portion of the output of their labor was paid to the landowner. Hence, the more attractive the terms of tenancy, the likelier its continuation. This kind of serf leverage was especially strong in the aftermath of the Black Death of the 14th-century. Offsetting this, however, is the consideration that average serfs reportedly could not leave their abode without permission from their lord. As for indebtedness, it was, like so many other aspects of a serf’s existence, a harsh, often permanent fact of his life as well. But the medieval serf had one advantage over the modern debt serf. At least he had time to surf haystacks instead of searching them for a second, needle-in-a-haystack job.